We’re thrilled that you’re participating in Bring Your Bible to School Day! Please take a minute to introduce yourself below and download your FREE how-to guide (including teen, elementary and parent/pastor versions). 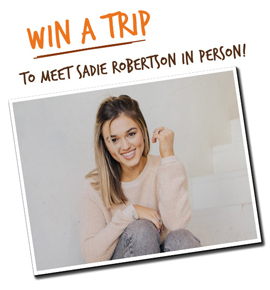 Also, by completing the information below, you are automatically entered for a chance to win a free trip for four to meet Sadie Robertson in person at one of her events! (No purchase is necessary. Read official giveaway rules). If you are under the age of 13, please have your parent fill out all of the information below, using the parent's (or legal guardian's) name and information. Note: Why are we asking for this information? Good question! By sharing this information with us, you enable us to more accurately estimate nationwide participation levels. This allows us to provide encouraging feedback to participants and fans. Requiring the birthdate is also the best way we have found to safeguard minors from getting other information that does not directly pertain to the event, issues and website they have registered to receive information about. Other requested contact information allows for the potential to notify you in a timely manner about future campus initiatives that could have a powerful impact on students and their schools! Note: If you are receiving an error message for your birthdate information, please be aware that you are unable to complete the form if you are younger than 13. If you are younger than 13, please stop and have your parent fill out the information for you, using the parent's/guardian's name and birthdate. Thank you so much!